In this article, I’ll cover Arm and Hand Body Language Analysis. I know doubt know someone that reads this article will say to themselves, “I just feel more comfortable with my arms crossed in front of me.” Body Language Analysis is used because it has been proven to work for many people. If you feel comfortable with a specific body position it is because you are feeling a certain way. Ask yourself, when would you feel comfortable with your arms crossed while enjoying yourself with a loved one? Have you ever seen anyone cross their arms in excitement? Just a few things to think about, as you read this article. This article was created because one of my readers asked for it. If you have any questions leave them in the comment section below. I’ll gladly answer any questions that I can. When shaking someones hand, if your hand is on top you are trying to dominate and vice versa. An equal handshake, in which both people shake in a vertical manor, with equal pressure, is the best way to generate good rapport. To make sure you are able to create an equal handshake, step slightly to the left and forward when approaching a handshake. Do not shake with both hands or touch any other part of the body unless you have an intimate relationship. 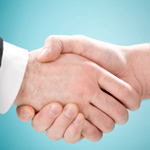 At most, a brief touch to the elbow during a handshake has been shown to generate good feelings toward a stranger. A valuable clue to whether the person is being open and honest is whether they are showing their palms or not. Honesty equals palm displays. When men lie they are obvious. When women lie they move around busily. If a person says they can’t do something and they show you their hands they are telling you the truth. If you are talking with your palms it will force others to speak truthfully. Hands clenched in front of a person means that they are holding back a negative reaction. Holding ones wrist in your hand behind your back is an attempt at self control. The farther up the wrist the person is holding is a barometer of frustration and anger. If a person places their head on their open hands as if on a platter they are saying that they admire you. If a person is picking imaginary lint they have a secret opinion that they don’t want to tell you. Hands folded in front, hand in hand, shows they are feeling vulnerable. If you use a palm down gesture you are exercising authority. This will antagonize most people. Pointing at a person is one of the most annoying gestures. Never rub your thumb to your fore-finger around people. The rubbing of the hands together shows that they are expecting something positive. The speed at which they are rubbing shows who they think will benefit. If a person rubs their hands very slowly they are showing they expect results just for themselves. The steeple hand gesture represents that you are confident and self assured. This gesture should be used very sparingly because it can come across as arrogant. If however you want to guarantee a look of confidence this is the look. By pressing your fore finger to your thumb you will come off as authoritative, but not aggressive. Holding hands behind the back shows that you are confident and feel superior. Hands on hips shows they are preparing to dominate unless the elbows are held close to the body and are submissive. If the person tucks their thumbs in their pants rather than rest their hands on their hips they are being very aggressive. Thumbs protruding from pockets shows that the person feels they are superior to others. If the hands are held out from the body that shows that they are feeling superior. We fold our arms in front of ourselves when we feel threatened or don’t like or trust something. If you are folding your arms while grasping your biceps it shows that you are feeling insecure. If you clench your fists while folding your arms people will see you as being hostile. Arms crossed with thumbs turned up shows that the person is warming up to you. Women will often use their purse to create protection in some situations. If in a meeting a person puts a drink on the opposite side of the hand in which they’re drinking that shows that they feel uncomfortable. It has been shown that if you briefly touch a person’s elbow, which is considered a public space away from intimate parts of the body, for less than three seconds, that gesture will give you three times the chance of getting what you want. Elbow and hand-touching, when done, briefly grabs attention, increases your influence over others, makes you more memorable and creates a positive impression on people. So the next time you meet someone new, briefly touch their elbow. This is considered the easiest way to make a great first impression. If you are having trouble getting someone to open up. Ex: Arms and Legs are crossed. Offer that person a drink to get them to open up to you. A hot beverage works best because the person will be forced to open up so they don’t burn themselves. I’ll continue with the Gestures and Body Language Tutorial in the next article. If you have any questions leave them below. I fold my arms with my hands up the sleeves if i’m wearin something big like a fleece and i cross my legs left over right and i just sit back in my chair and just gazing across my room. My top tip is if you don’t like people seeing your hands, just pull them up the sleeves and grab the ends. Hi my name is Olly and people just think that i’m hiding away when i’ve got a fleece on and my advice is this – if you don’t like people seeing your hands just pull them up the sleeves and grab the ends and then fold your arms and cross your legs. hi. i just noticed that whenever i walk i always hold my right wrist with my left hand. how do you interpret this? thanks. Do you hold your hands infront or behind your body? i hold my right hand with my left hand infront of my body. You do that to provide a slight amount of protection. My guess is that when you do this you don’t feel threatened or intimidated, but are just careful naturally. If you held your arm like this behind your back, that is a sign that you are restraining yourself. thank you so much for your explanation it surely helps. and your absolutely right that im just careful naturally. It depends on whether you hold your hands together in front of your body, or behind and whether your hands rest above the waist or below. I’m guessing, you hold your hands behind your back which means you are either confident, or trying to restrain yourself from acting, talking, etc. Hi! Just curious, I noticed this the other day. sometimes i walk with only one arm behind my lower back, palm facing out. the other arm is usually holding onto my purse strap over my shoulder or has a folder or notebook. I had the weirdest body language, expression or I dont know what to call it. While talking to this girl who works for our company. She locked her fingers in front of her body, palm to palm, then turned her arms outward to show both her medial ante-brachials (had to look this up (the joints behind the elbows where the biceps start.)) while looking to her right through a window. I thought it was weird. Maybe you can shed some light on this. I really appreciate it. Hi. On meeting someone that I’ve met a few times (in relaxed circumstances as friends, not business) I noticed that this person was reaching for my hands a lot. What does this mean? It is a person who is not a friend, but we have met before a few times in mutual circumstances. On the most recent occasion this person kept reaching for my hands to shake them, hold them, high fives, etc. I can’t find much info about this, I just wondered if its possible to read this kind of body language? A person touches someones hand when they have feelings for them. This happens between females when they are trying to show that they understand the other female. The person instigating the hand touching could also have a desire to become friends with the other. This is normally a desire to jump from a simple relationship towards a more deep friendship. People also try to hold someone else’s hand if they feel deeply alone. They have a deep desire to start a two way relationship. They may as well feel that you are drifting away from them. I sit with my arms and legs crossed while wearing my fleece, i have my hands up the sleeves (don’t know why i do it) but this position can be really comfortable. That is why you are supposed to jude people after analyzing many body positions. Whenever I do this while walking, I feel relaxed and all. But, what does that posture means? Please tell me everything about the guest. He is in power, his policy in urban renewal makes many poor people suffer. I have two questions, please advice. One lady worker was lying on a fact infront of my superiors and When I spoke the truth to them infront of her with evidence. she started looking at the wall first without a reply for a while. The next when I put another example of her mistake after that she made a frowned eyebrow reaction and spoke some reply in defence. I want to know what the two reactions means, is she trying to hide the truth or any hint can I get about the exact nature of that person.Please let me know. Also she speaks in a very low voice(sounds very unprofessional or intimate at times) while speaking to fellow workers which is not her original voice as I have heard her speaking in a normal voice. She walks with her chin facing a bit upwards always and most of her eye gestures are sideways. Could you please let me know what does these body language and scenarios explained above indicates about the person. It sounds like she was just caught in a lie and was trying to formulate a way out of it. The frown shows that she was disappointed in not finding a defense, or simply upset she was caught. Sideways looks show that she is a verbal thinker. She remembers what she has heard above what she has seen. Since most people are visual that will make communication hard for her. Your article is wonderful and it is really a learning center. 1)My boss is very unusual kind of a person.Sometimes he acts friendly and discusses many of the facts which a senior person should forbid. But for very minor misses or so he creates a big issue. and he smiles with one cheek, the other one stays unmoved.Any idea what kind of a person he is? 2)Another girl whom i observed keeps her mouth a bit open(upper lips a bit raised under normal conditions) as if she has to say something. There is no problem in her mouth she is as normal as others, she speaks very less usually but this is one of her habits. What does that indicate? 3)How can we identify a hypocritical person by her/his body language?Any tips will help , what kind of body movements they have, how they speak.And I would be keen to know how to identify the person is hypocrite when they speak less? Thank you very much 🙂 I’m happy that you are enjoying it. I’ll do my best to answer your questions. 2. Parted lips show the sign that the person wants to talk. If just the top row of teeth are showing this is a grimace of disgust normally if the eyes are not kind. 3. I’m not sure you can tell if a person is a hypocrite through body language. I have found the easiest way to tell if a person is worth being around is to gage their self esteem. Here is a self esteem test for personality. What source did you gather this information from? Hi there. I don’t normally do this but I’m front of my crush I kind of held my shoulders apart, clasping my hand over my other hand and sometimes my wrist when she was talking to a group. She looked down at my hand and then carried on. How do you think she saw this? I’m confused myself to be honest. I always sit with my legs crossed, and I sort of hug myself with my sleeves covering my hands. Does this mean anything particularly? You may be cold? It is important to baseline and eliminate comfortable body language and then watch what changes during questioning. I should have spent more time on that in the video. What does it mean when a boy holds the tips of a girl’s hand? If you were holding your hands as if you were praying that would make a lot of sense. Hello, I am a vertical hand shaker I recently shook the hand of a male Palm downer and I discovered with out realizing why, my pointer and middle finger extended out to touch his wrist. This was the conclusion of a first time conversation. I was wondering if you had any insight. If a person means to flip your palm up during a handshake and you resist they will subconsciously take that as an insult. I always let people do what ever they’d like with my hand. That way I see how they see me. I then can use body language analysis and indirect hypnosis to turn them towards my side if I want. That is definitely a sign of attraction. Any touching between different sexes is normally sexual in one way. I discovered recently that I can cross my arms behind my back, exactly the same as how you cross the in the front. I can even put either hand on top. I find it relaxing and it does not pull my shoulders open, I can still slouch or hold any position I like. Could people perceive that as anything or is it just a quirk? It is a sign of confidence. I do that as well. I recently realized that I have a weird tendency of holding my hands up in front of my chest. It’s rather hard to describe, but imagine a prairie dog’s, or perhaps a t-rex’s, arms. It feels completely natural to me. What could this mean? With your hands apart? I’m not certain. I’d love to know more since I don’t think i have com across this. I was recently asked why when talking to a colleague, I put my wrists on my waist with hands pointed out/back with palms-up. This posture was started while working with micro-biological organisms years ago trying to not contaminate anything. What is this posture telling people? That is very interesting. People would more then likely see that as either a defensive or just a peculiar position. Hi. You wrote: “It has been shown that if you briefly touch a person’s elbow…for less than three seconds, that gesture will give you three times the chance of getting what you want. Elbow and hand-touching, when done briefly, grabs attention, increases your influence over others, makes you more memorable and creates a positive impression on people. Upon a first introduction, a man shakes a woman’s hand firmly (but not crushingly) and holds it, while holding and squeezing her elbow with his left hand. This was much longer than 3 seconds! While looking intensely into her eyes, this handshake and elbow squeeze/rub lasted the entire 20-30 seconds he spoke, as if there were not 200 people in the room and others in line behind her waiting to greet him. He did not do this with everyone else. Woman was voluntarily in line to greet him and actively listen to his comments. What is your interpretation of this? This is definitely a dominant move made by someone that understands body language. I would never do this to a person because I don’t consider it a way to kindly show your interest, but instead this is a power play that says he is in control of them. Hi! So, my question is what happens if you feel more comfortable while holding, actually grasping, someone’e t-shirt/shirt in your hands or just their shirt sleeve, maybe while walking or just like that – what does that signify?